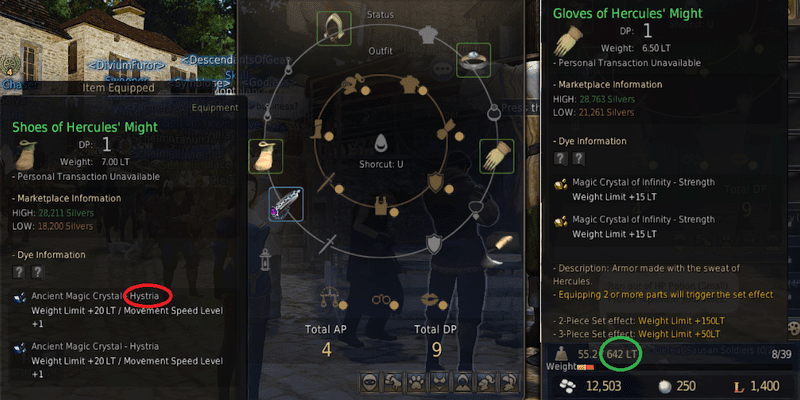 This is the detailed description of the best way to get rich in Black Desert Online: having a worker empire. It is long, so most people won't read it. Well, as workers create no silver and selling on the market destroys silver, the silver must come from somewhere and that "somewhere" will be people who don't read it and grind instead. 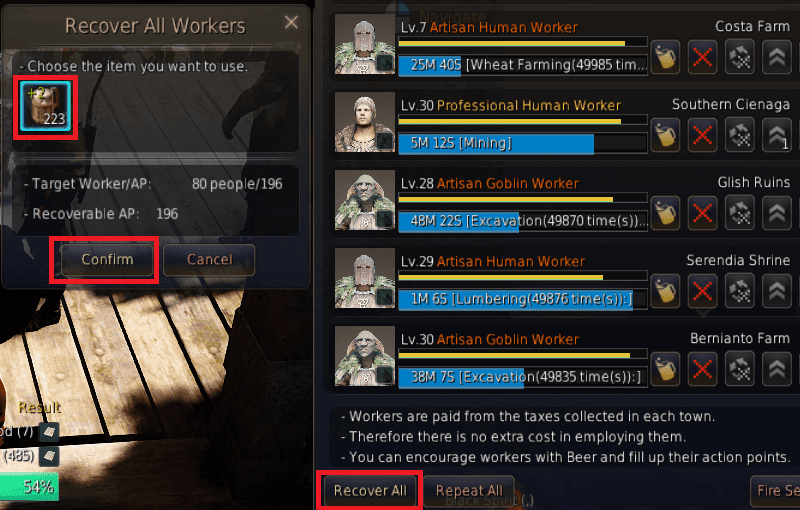 The workers are essentially a stereotypical mobile game resource gathering implemented into BDO for some reason. You click on the resource and it's collected in real time. How much? About 20M silver worth a day. 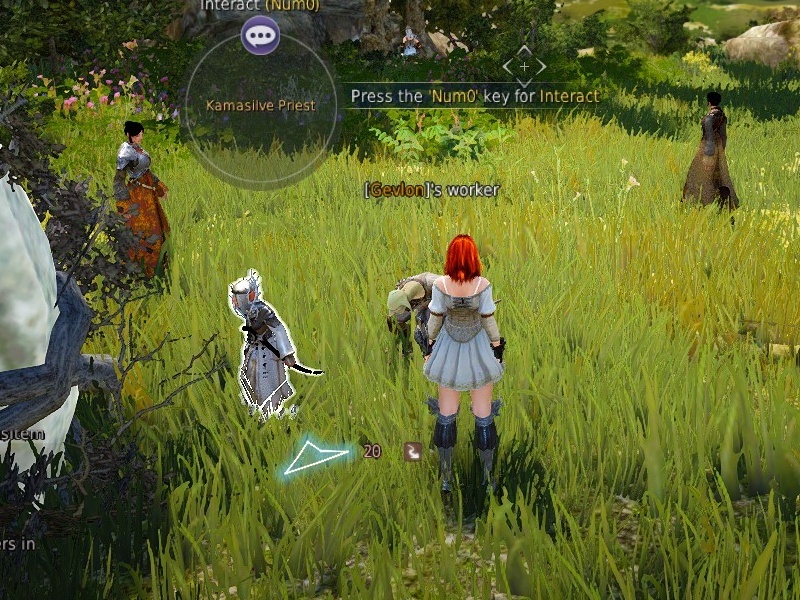 To harvest it, you need less than 30 minutes of actual "at keyboard" time, but even most of that is not clicking, but waiting for character switch and autopathing from spawn point to storage. There is one catch though: for some bizarre reason, workers only work when you are online. So in order to use them, you must leave your computer running. Important note: you don't need levels or gear to use this method. 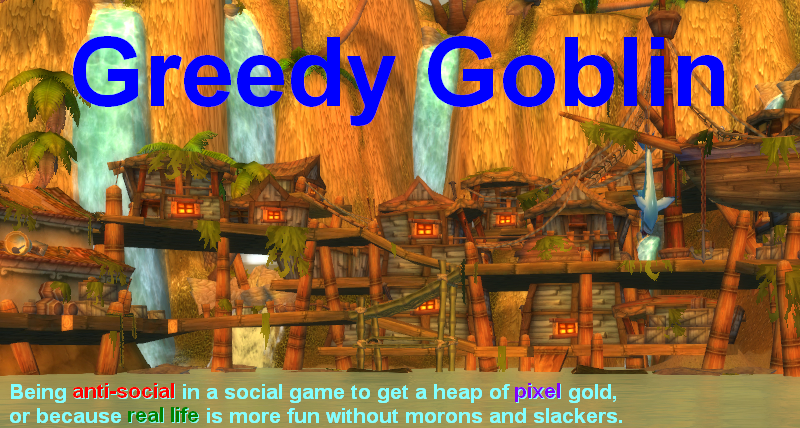 You can start using them literally as a new player and earn income thousand times higher than grinding low level mobs. With the income you can buy gear a new player can't dream of and oneshot level-appropriate monsters. Walk speed: the higher, the faster the worker reaches the destination. Important if the node is afar. Luck: the higher, the more secondary resources you get. For example if you farm chicken meat, you can get eggs. Stamina: how many cycles he can do before refreshing. Refreshing must be done manually, by clicking on food item. You obviously can't do it while not at the keyboard. 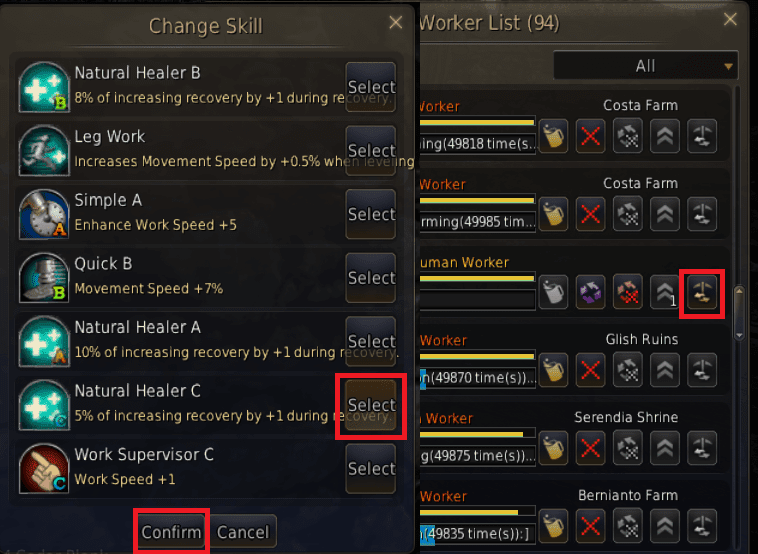 You can see these on clicking on the worker icon top left of the screen or selecting the "Worker List" item on the ESC menu and mouseovering one worker: ?br: The quality of the worker is the most important thing. You can improve it two ways: by firing and hiring a new worker and promotion. 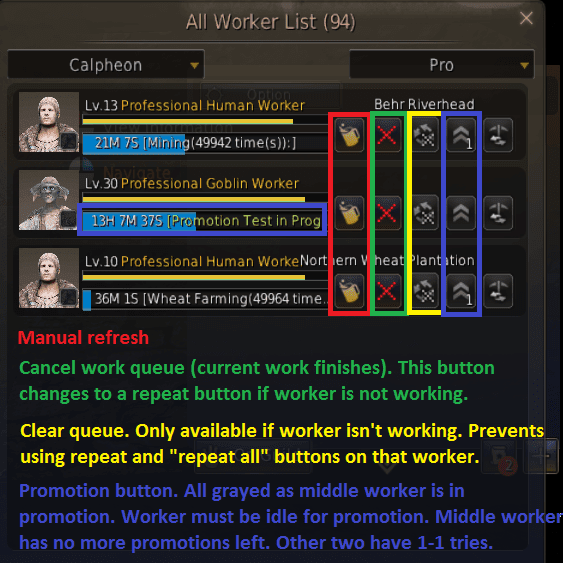 That takes a day, only one worker can be promoted at a time, promotion fails more often than not and all workers get one try every 10 levels (3 combined). 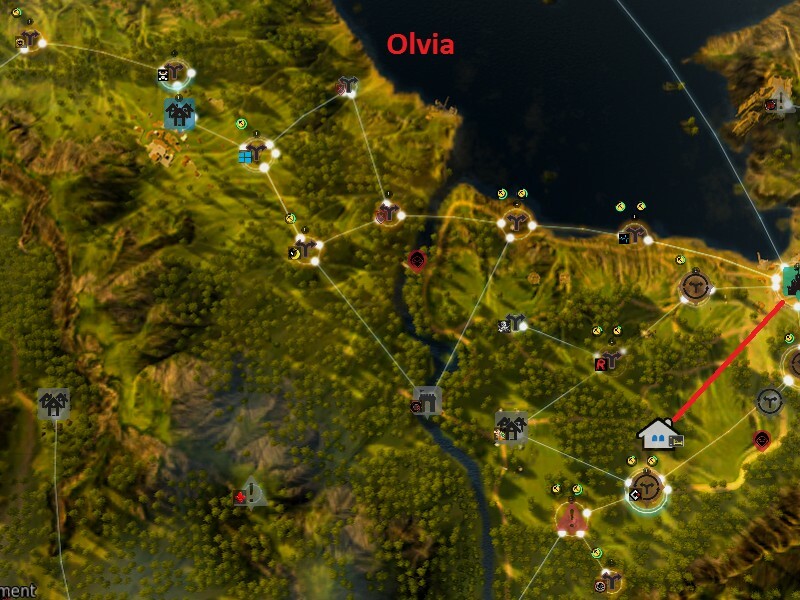 Olvia is the starting zone, yet it's really important, because Velia is horribly lodging-starved, so I staff most of the near-Velia nodes from Olvia. 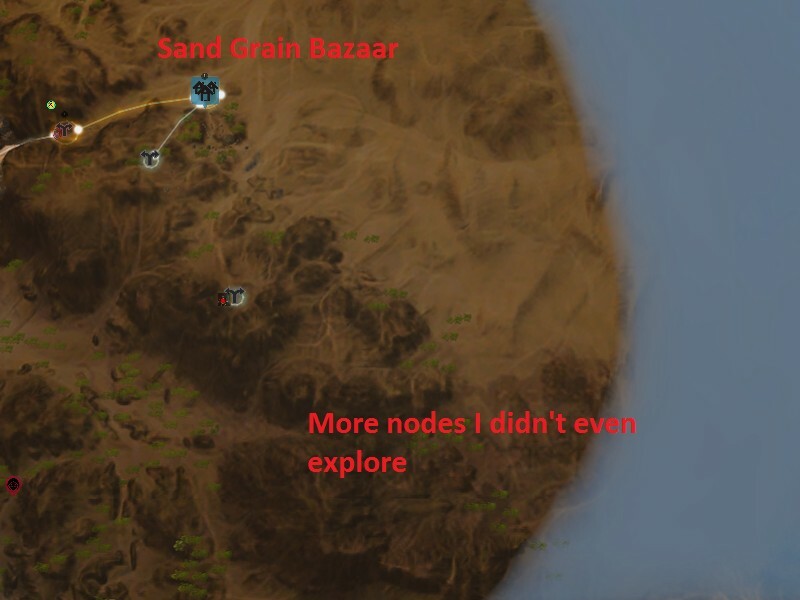 Poor Sand Grain Bazaar is in even worse condition. Update: since then I activated its teff farm, but there are still several lucrative nodes on the south I didn't even explore. The workers deposit their products in their respective towns. 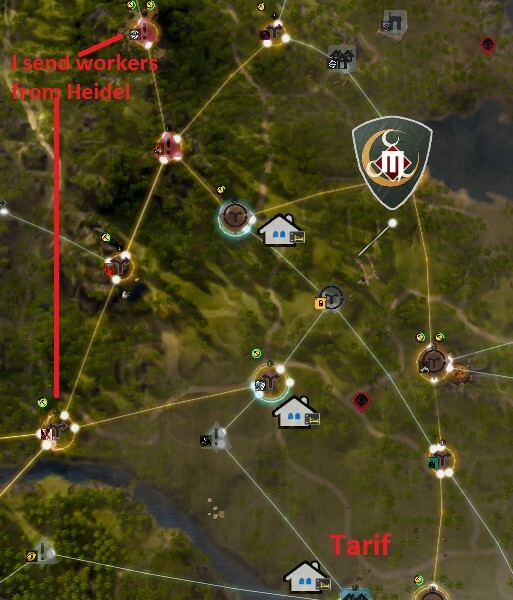 How do the products get from these places to Heidel where I sort, process and sell them? Two ways. The simpler is Warehouse transport. Just open the map, select the town and press transport. Then click Send and set the destination along with one available transport method. Then click on the materials until all of them is in the transport window and press Send at the bottom of the transport window. The catch? The stacks are broken up: Why is that a problem? 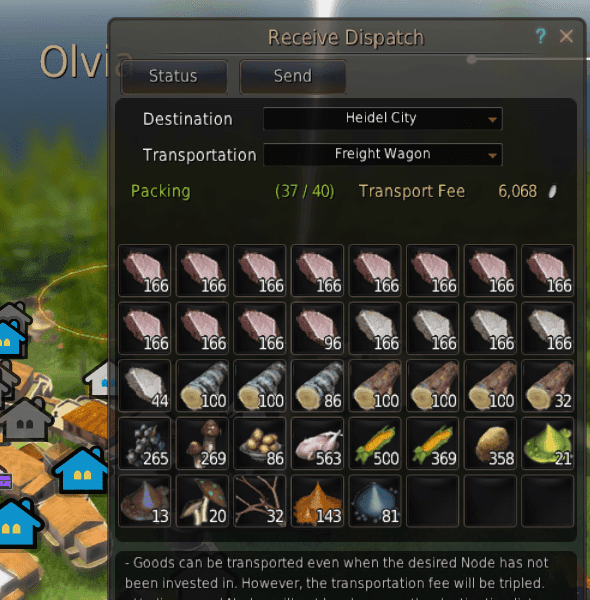 Because this single Olvia transport takes 37 packages and only 100 can be en route. Which means after a few towns you have to wait 2 hours while they are transported, use the same transport method in your headquarters and press "Receive All". 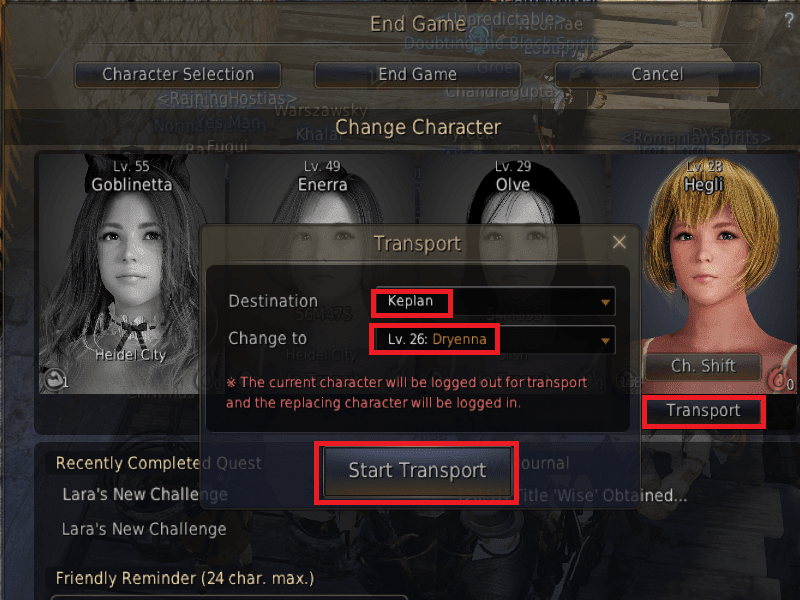 Only after that you can start another transport. 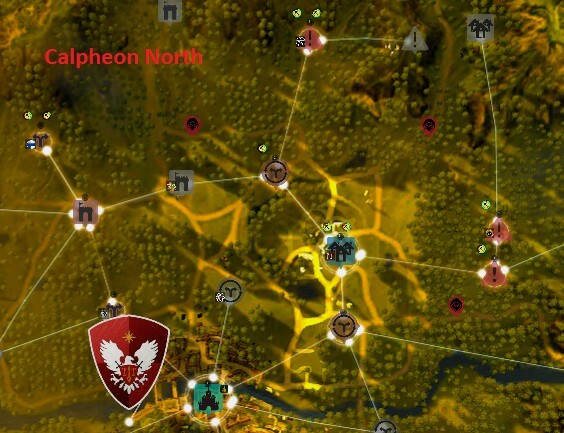 You must also connect the nodes between the two towns to make this possible. That costs contribution points. 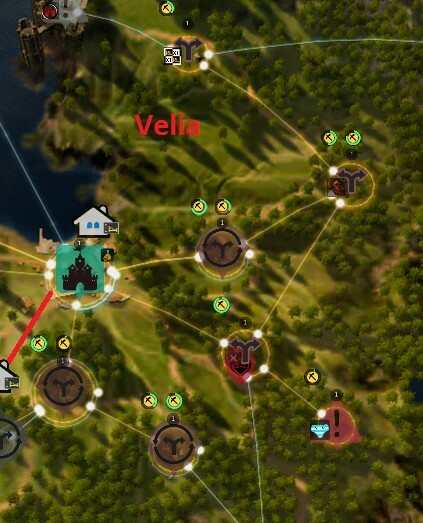 3 for connecting Velia (and Olvia connected to that) to Heidel. Same for Glish. Tarif is already connected due to lodging problems. 1 point to add Altinova to that. But good luck connecting Sand Grain Bazaar or Trent. Finally, even if you connect Trent, there is no trade route. 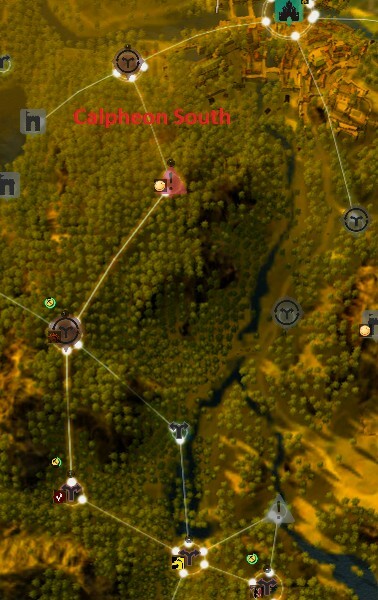 You must transport from Trent to Calpheon and from Calpheon to Heidel. Considering how many stacks the Trent wood is cut into, transporting it twice would be quite a pain. How to get workers? You must go to the work manager (NPC finder, "worker") and select contract worker. For 5 energy a worker is suggested to you. If you are starting up and need to hire lots of workers, take every except Naive. But after your nodes are covered, start accepting only blues and above, firing greens. When no greens left, start to fire blues and replace them with yellows. You get a yellow from about 200 energy. You can get extra energy by buying a bed and lying into it. Remember: if you want a Velia worker, you must hire him from Santo Manzi, the Velia manager. "There is one catch though: for some bizarre reason, workers only work when you are online. So in order to use them, you must leave your computer running." That's enough to count me out. Electricity prices here in Australia are way too high for me to have my PC running a game constantly just to generate some in-game coin. You should note that BDO have a "low power" mode where it's just stay on the taskbar minimalized and not using any cpu or vga. But yeah your computer still have to run. It was the reason for me too not buying this game after the trial (and the horrible way they handle the graphics degrading with distance. I think it's just disgusting). Is there a good way around questing for CP? I really-really dislike running the same 10 quests on 5 alts (to the point where I'd rather run around a tower for days killing the same mobs). If skipping questing makes the process twice as long, though, I'll bear with it. Also, how do goblin workers work out in the end? It feels like having to refresh beer three times as often would almost triple interaction time. Or does it get better as they gain levels and promotions? I just started the game a couple days ago and my goblin worker is only a green with 8 energy, compared to 30 of the human green. @Anon: of course there is, I haven't run repeatable quests for a loong time. Post will come soon. They will together form the guide. Humans never had 30 energy. A green human has 15, a giant has 30. An orange goblin has 15.
the few month at release for idle-time I let the game run on my 5yo toshiba satellite notebook with screen closed. so sleep and work time is covered training horses. Or later on, on mobile via VNC server: processing! As Cathfaern said, I minimized the game so the wattage impact is minimal. Thats not correct. 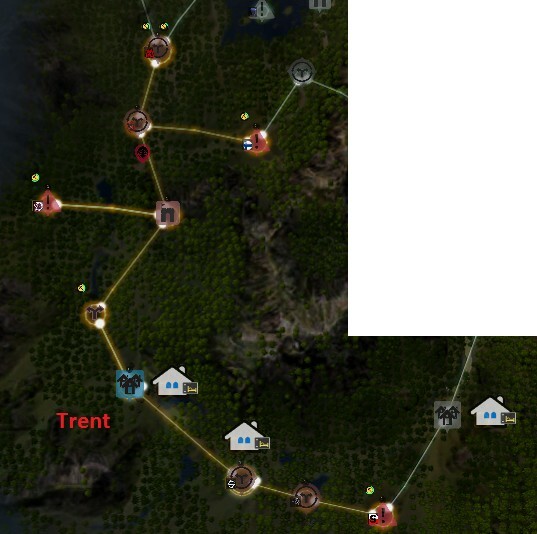 If towns are not connected, the transport will cost 3x more. You should give the valencia nodes a closer look, there are some realy good ones. 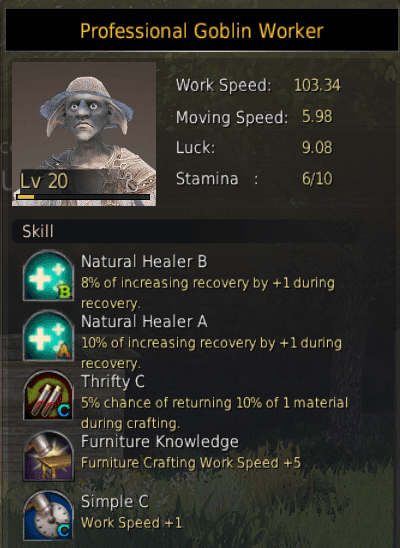 Hi there, I just started to play BDO so this may be a stupid question: do you sell the materials on the marketplace or just to a npc? 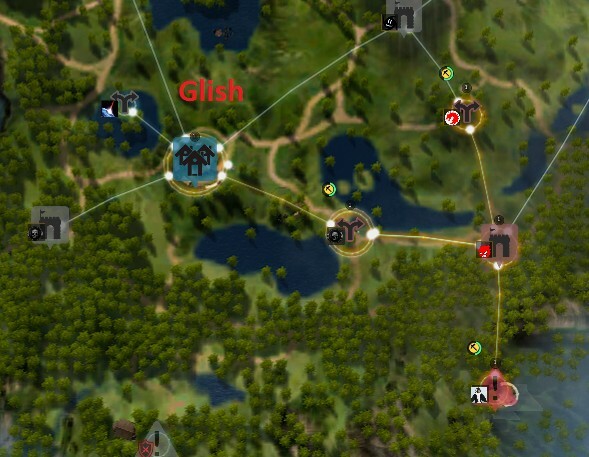 By counting the nodes you used in velia u have MAX 8 workers there and you are using 9 how? 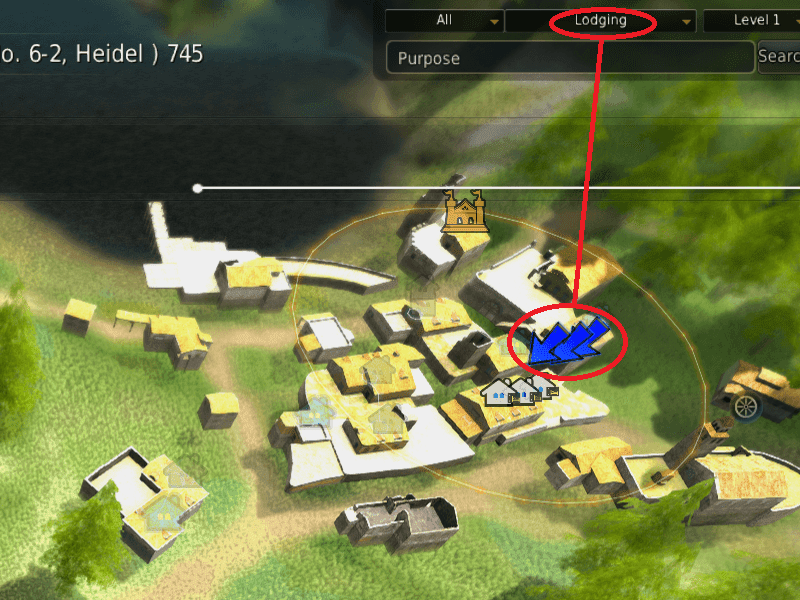 i am not even counting the the 1- from bartali farm as i suppose it will be supported from olivia and the ancient stone chamber on Olivia map is supported by heidel since it is also in the heidel map. so can i get a Confirmation that's everything i assumed is true? and explanation of how you doing 9 in velia? I sent a comment earlier Ignore that because heidel can't supply the nodes i was talking about. there is something wrong no idea what. 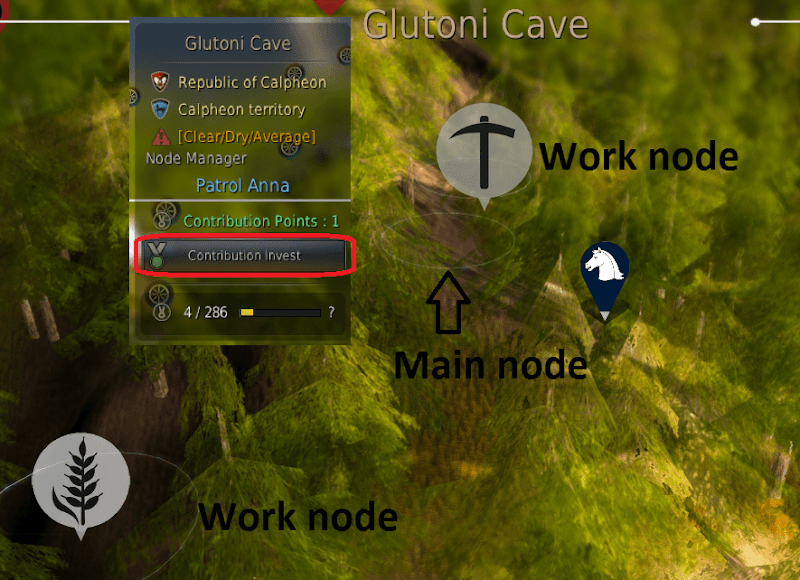 There is total of 8 workers in velia 16 workers from Olvia according to screenshots you provided You are supplying 26 Nodes. 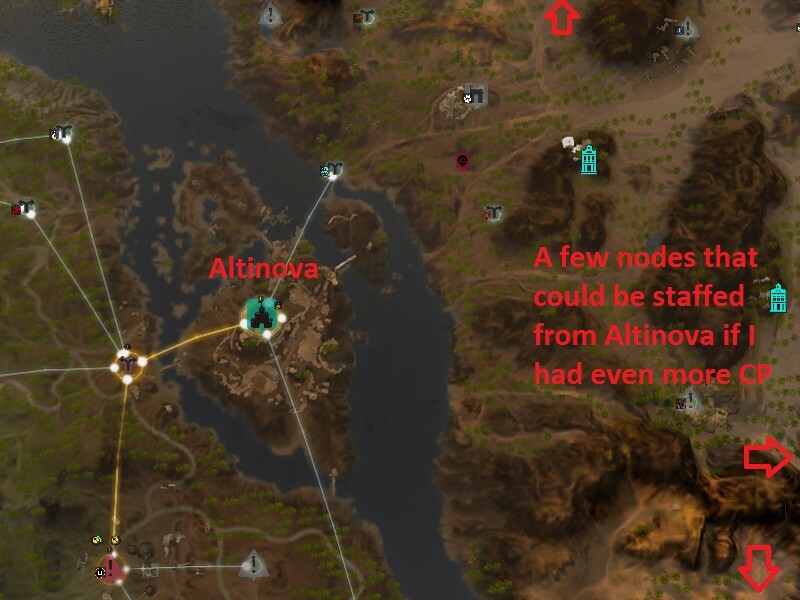 by further Counting there is 16 nodes in Olvia Image which is okay for 16 workers. 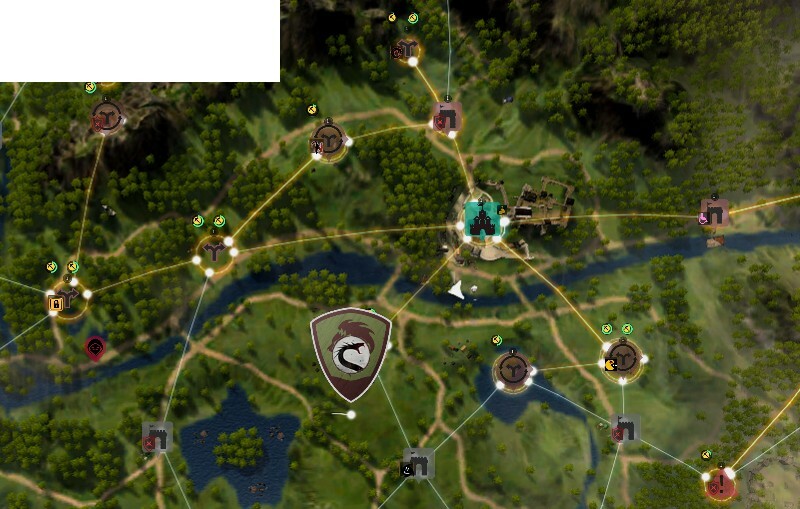 but velia screenshot there is 11 removing the 1 which is supplied from Olvia Now we have 10... 10 Nodes 8 workers Explain please? Supplied from Heidel and Olvia. Olvia has awful lot of lodging.